It is pleasing to see the abundance of ecological products now available in large stores. It makes it easier for consumers and businesses to make green buying choices they would not ordinarily make due to purchase order requirements or contracts with certain suppliers or simply convenience. No better (or more cost-effective way) to do so than with Staples eco-preferable products. 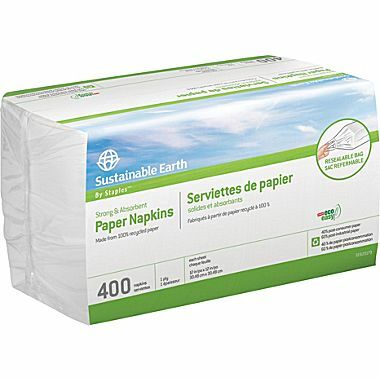 Made from renewable resources and recycled materials, Staples has eco-conscious offerings that will “green” your clean. Natural cleaning products get the job done and leave your home and surfaces fresh and spotless. The glass cleaner is Green Seal Certified. I do not use paper napkins in my home, but I do see how businesses would need them (and I do use them when I am in a cafe). As stated above, it is great that consumers have a choice now to shop for green products where they are buying other office supplies. I appreciate Staples’ efforts to be more eco-friendly. It is where I take my toner cartridges to be recycled.